Tyrant Ivan the Terrible was radical both in his politics and his cuisine. Reformer Peter the Great never ate fish. Enlightened Empress Catherine the Great treated her guests to pheasants. RBTH explores these and other curious facts in Russia's gastronomic history. Little is known about meals that were served to Ivan the Terrible, one of the most eccentric Russian tsars. According to Austrian envoy Sigismund von Herberstein, the author of "Notes on Muscovite Affairs", the tsar was an incredibly hospitable host. "Lunch would last three or four hours," von Herberstein wrote about meals at the tsar's palace. 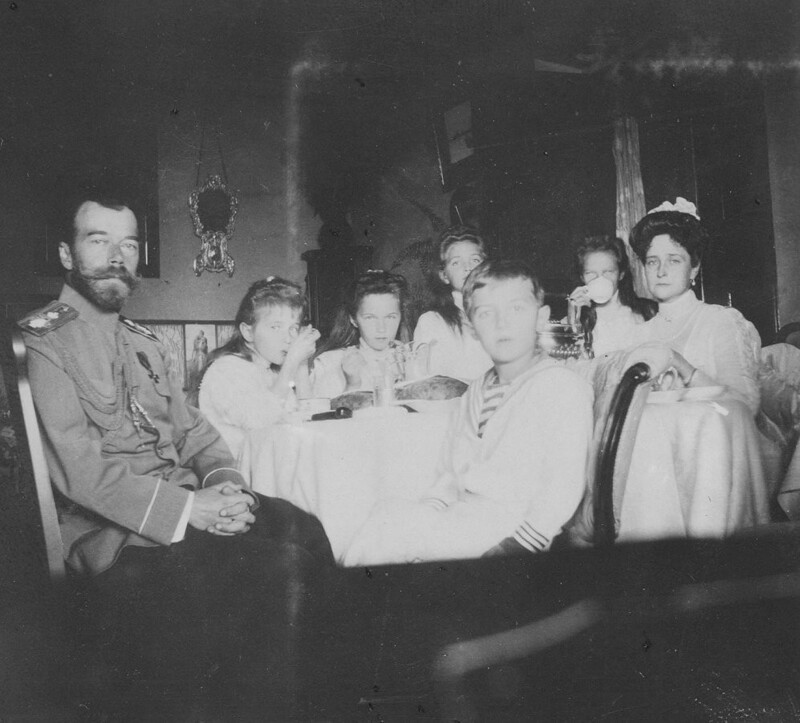 "During my first mission to Russia, we even ate till after midnight… The tsar often treats his guests to food and drink…"
A more detailed description of a royal meal can be found in a historical novel by Aleksei Tolstoy called "Prince Serebrenni": "Once the swans were eaten, servants, in pairs, left the chamber and returned with three hundred fried peacocks… The peacocks were followed by kulebyakas, chicken pies, meat and cheese pies, all possible varieties of blinis, pastries and fritters…"
The next change of dishes was even more impressive: "The tables were laid first with meat jellies, followed by cranes with spicy herbs, marinated roosters with ginger, bone-free chicken, and duck with cucumbers. Then there came different soups and three varieties of ukhas." The tsar treated his guests only to classical Russian dishes of the time. For example, a kulebyaka (coulibiac) is a traditional pie in the form of a thin pastry shell and a generous filling, often consisting of several ingredients. The filling of a chicken pie (called "kurnik") was no less complex, with poultry meat, primarily chicken, being the main ingredient. A meat jelly (also known as aspic) is a cold jelly made of meat broth with finely chopped meat inside; while an ukha is the traditional Russian fish soup. The first Russian emperor, Peter the Great, was a man of modest tastes. One of his close associates, a mechanic and a sculptor, Andrey Nartov, recalled: "Peter the Great did not like any splendour, luxury or to be surrounded by many servants. … His food consisted of cabbage soup, aspic, porridge, grilled [meat] with pickled cucumbers or lemons, corned beef, ham. He was particularly fond of Limburger cheese. All of the above was served by his chef Felten. Of vodkas, the tsar preferred anisette. His usual drink was kvass. At dinner, he drank Hermitage wine (red wine from the northern Rhône – RBTH), sometimes Hungarian wine (sweet, Tokaj – RBTH). He never ate fish…"
Anisette, which Peter the Great so favoured, is widespread in Europe too, whereas kvass is a traditionally Slavic drink that remains very popular in Russia still. In olden days, it was invariably served at weddings and other feasts (there were different varieties of it, depending on alcohol content). Catherine the Great had the reputation of one of the best educated women of her time and a proponent of the philosophy of European Enlightenment. In her later years, she developed as simple a taste in food as Peter the Great had. According to historians, her favourite dish was boiled beef with pickled cucumbers and sauce made of dried venison tongues. Of sweets, she preferred the famous Kolomna pastila (this classical Russian dessert is made of whipped fruit puree that is later dried following a special recipe). When entertained by her favourite, Count Potemkin, who had a dozen foreign cooks working for him, the empress was particularly impressed by "bombs a la Sardanapal" prepared by a French chef. The dish consisted of cutlets made of minced game meat. However, during official meals the empress was not as modest as in her private life. In his book "Repast History of the Russian State", Professor Pavel Romanov describes one such banquet consisting of over a hundred dishes. The empress and her guests were served a dozen soups, poularde and quail with truffles, pheasants with pistachio nuts, bass with ham, teal with olives, tortoise meat, lamb roast, etc. Some of the dishes were clearly inspired by French influences. This is not at all surprising since, during Catherine the Great's rule, it was fashionable among the Russian nobility to hire French chefs and Russian cuisine was changing under their influence. 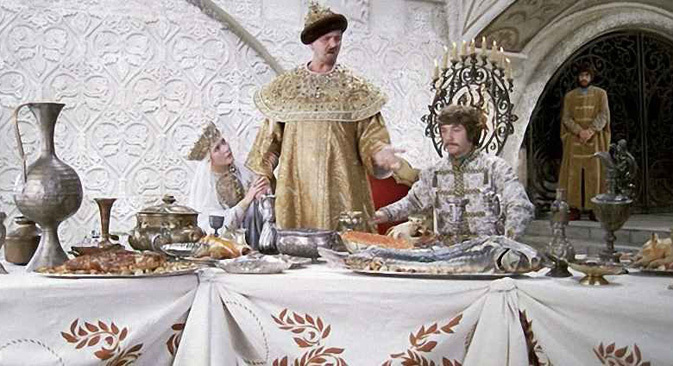 To an unprepared foreigner, Russian tsars' menus often seemed puzzling. One historical anecdote tells the story of how a Russian tsar sent a Western European counterpart of his a pound of black caviar and the European monarch, out of ignorance, instructed his cooks to boil it first. An English ambassador to the court of Alexander I once found himself in a similar situation. The tsar liked discussing gastronomical topics with him and once, as a follow-up to a discussion they were having, presented the ambassador with botvinya (a complex soup based on kvass, sorrel and beet greens with boiled fish). The ambassador, thinking that "those strange Russians" have sent him a soup that has grown hopelessly cold, ordered it to be warmed up, unaware that this Russian specialty should be consumed only cold. Having said that, not all foreigners showed themselves so ignorant when it came to Russian cuisine. For example, the legendary French cookery specialist and author Alexandre Dumas Sr. described the above mentionedbotvinya as "the queen of Russian soups". Alexander II, who abolished serfdom in Russia in 1861, was known on the culinary front as the tsar who introduced a strictly observed duration of meal times at breakfast and lunch for members of his family. Each meal was supposed to take exactly 50 minutes. Mihály Zichy. 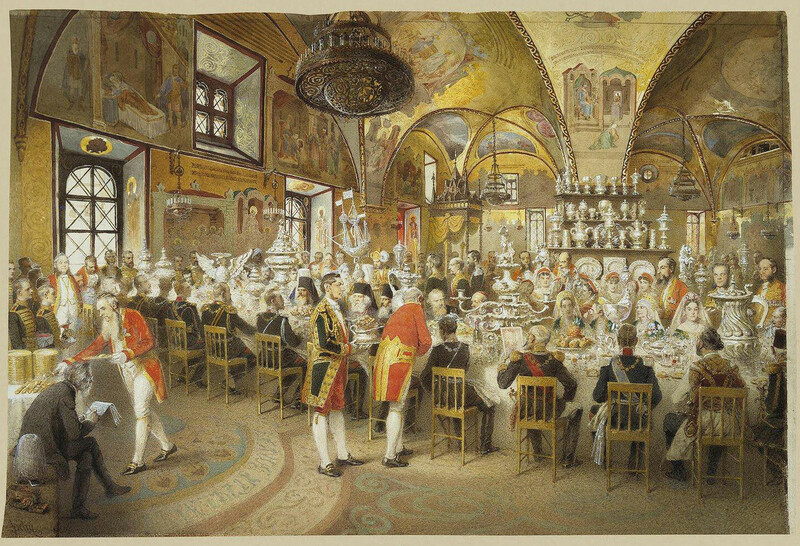 The gala dinner in the Concert hall of the Winter Palace, 1873. The task was made all the more challenging because the tsar from time to time changed the venue for these family meals, with some of them being so far from the kitchens that staff found it extremely difficult to get all the food on the table in time and hot. In the end, they came up with the idea of using large hot water bottles to keep the food warm. The trick did not always work with delicate sauces, whose original taste and smell was sometimes affected. But punctuality was more important. Alexander II's son, Emperor Alexander III, was much less of a pedant and remains in royal culinary history as the tsar who "started a new era for Russian winemaking". According to the head of staff at the Imperial Court Ministry, Aleksandr Mosolov, "under Alexander II, all served wines were foreign ones. Alexander III started a new era for winemaking in Russia: he ordered serving foreign wines only when there were foreign monarchs or diplomats present at the meal. Otherwise, all served wines should be Russian. 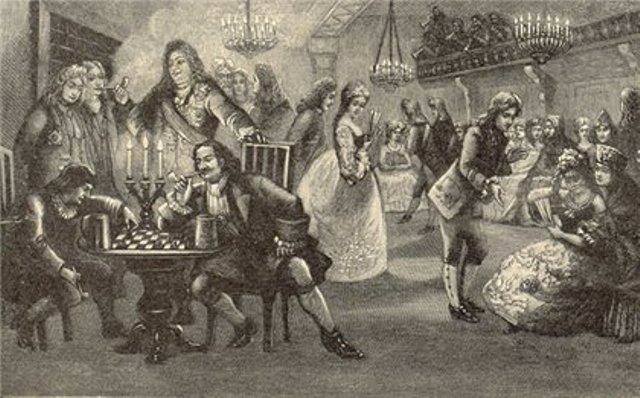 I remember that many officers found this wine nationalism misplaced: instead of assemblies, they began eating in restaurants, which were not obliged to follow the monarch's instructions." However, soon attitudes towards Russian wines changed: largely thanks to the efforts of Prince Lev Golitsyn, who set up the famous wineries Massandra and Novy Svet. Gradually, Russian wines ceased to be seen by the Russian nobility as an oddity. The best chronicled in history are the culinary preferences of Russia's last tsar Nicholas II. Here is, for example, what Aleksandr Mosolov says in his book "At the Emperor's Court": "Lunch [at the Livadia summer palace in Crimea] began with a soup with small vol-au-vents, savoury pastries, and small cheese toasts. Importantly, vol-au-vents were served together with the soup rather than as a separate dish, as they are abroad. The soup was followed by fish, a (game or chicken) casserole, vegetables, sweets, fruit… To drink, there were madeira, white and red wines for breakfast (or beer as an option) and different wines served at lunch, as is the custom everywhere else in the civilised world. And liqueurs with coffee…"
All this was cooked by the emperor's favorite chef, Frenchman Pierre Cubat. Alas, after the 1917 revolution, French influences on imperial cuisine became a thing of the past. As did imperial cuisine itself, to be replaced by a Soviet culinary era.